When you think about manipulating visual media, Adobe CS4 Design Premium automatically comes to mind. The Adobe CS4 menu offers many options and tools to help edit and install pictures and active graphics. And, you can always make use of shortcuts to do what you want to do more quickly. Adobe CS4, like any software, gives you menu options to open, close, and save. Menu options also enable you to import, export, and undo, in addition to other basic commands. Here’s a table that shows common options and what they do. New Creates a new document in the native file format. you’re prompted to save those changes first. Save As Saves a new copy of the current document. Undo Undoes the most recent thing you did in the program. Redo Redoes the steps that you applied the Undo command to. Help Opens the help documentation for the current program. Like most other applications, Adobe offers keyboard shortcuts so that you can access its features quickly and easily with the touch of a key or two. 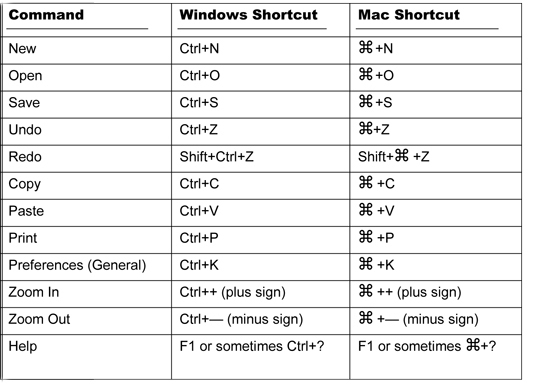 Explore the shortcuts that are used the most, by both Windows and Mac users. Knowing how to use the panels in Adobe CS4 can help boost your creativity and make your job easier. Adobe panels offer information and tools to help you add color, align objects, and generally transform your Adobe files (and yes, there is a Transform panel). Color: Use the Color panel to select or mix colors for use in the current document. Choose different color modes, such as RGB (Red, Green, Blue) and CMYK (Cyan, Magenta, Yellow, Black), from the panel menu (the arrow in upper-right corner). Info: The Info panel shows you information about the document itself or a particular selection you’ve made. The Info panel includes information on size, positioning, and rotation of selected objects. You can’t enter data into the Info panel. It only displays information instead of accepting it, so use the Transform panel to make modifications. Swatches: You can use the Swatches panel to create a library of color selections, which you can save and import into other documents or other programs. You can store colors and gradients that you use repeatedly in the Swatches panel. Tools: The Tools panel (commonly called the toolbar) isn’t available in all the Creative Suite programs, but it’s a very important panel in the programs it does exist in. A program’s toolbar contains the tools used in that program. Layers: The Layers panel is used to display and select layers. The Layers panel also enables you to change layer order and helps you select items on a particular layer. Align: The Align panel enables you to align selected objects to each other or align them in relation to the document itself. This panel makes it easy to do precise alignment with multiple objects. Stroke: The Stroke panel allows you to select strokes and change stroke attributes, such as color, width/weight, style, and caps (ends). The program you’re using determines what attributes you can change. Transform: The Transform panel is used to display and change the shear (skew), rotation, position, and size of a selected object in the document. You can enter new values for each of these transformations. Character: The Character panel is used to select fonts, font size, character spacing, and other settings related to using type in your documents. Adobe CS4 is full of tools, most identified with little icons that hint at their functions. For example, use the tool that looks like a brush if you want to create brush marks. (Smart, huh?) Peruse this table that shows the most common tools and what each one does. Selection Selects elements in the document. Lasso Makes freehand selections in a document. Magic Wand Selects similar adjoining colors in a document. Pen Creates vector paths in a document. Text Adds text to the document. Shape Creates various shapes in the document. Hand Moves the contents of the document for viewing purposes. Zoom Changes the magnification of the document.